Don't fear Chrysler's Uconnect Touch system that's offered in the 300 model line; unlike systems such as MyFord Touch and GM's CUE, it offers plenty of traditional buttons, knobs, and redundant controls for climate and audio functions. The image-building 2013 Chrysler 300 is handsome and classy, as well as a proper luxury car or a scorching muscle sedan. The 300 and 300C are the flagship models of the Chrysler lineup, and they're more than just the largest sedans from the automaker. With suave sheetmetal, well-rounded performance even with the base engine, and an impressive level of technology and luxury features, these rear-wheel-drive sedans are arguably better than the sum of their parts and feel more like high-end luxury models. Visually, the 300 sedans are have always hit a sweet spot between modern, ornate, and traditional. In any case, the 2013 Chrysler 300 remains a swaggering hulk of a sedan. Last year's redesign brought a somewhat smoother, less broad-shouldered look, with the cartoonish grille and brash details toned down, too. Inside, the look became smoother and richer, with regrouped controls and an LCD touchscreen filling the middle of the dash; there's also a bit more metallic trim to provide framing, while a carbon-fiber look or naturally finished wood for trims sets a modern, elegant tone. Base V-6 versions of the Chrysler 300 perform well enough to satisfy anyone who mainly looks to the 300 for its styling and luxury. The 292-horsepower version of the company's Pentastar 3.6-liter V-6 is smooth, strong, and responsive with the eight-speed automatic that's included in most versions. Times to 60 mmph land at around eight seconds, while highway fuel economy is up to 31 miles per gallon--extraordinary for a large sedan in this class. 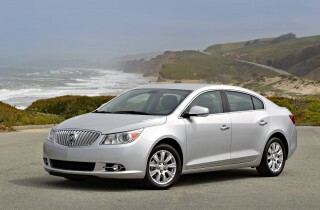 Also for 2013 on the step-up 300S, the V-6 gets a cold-air intake and performance exhaust making it good for 300 hp. For some, the real appeal for the 300 will be in the brash V-8 powertrains in the 300S and 300C, as well as the top-performance SRT8. 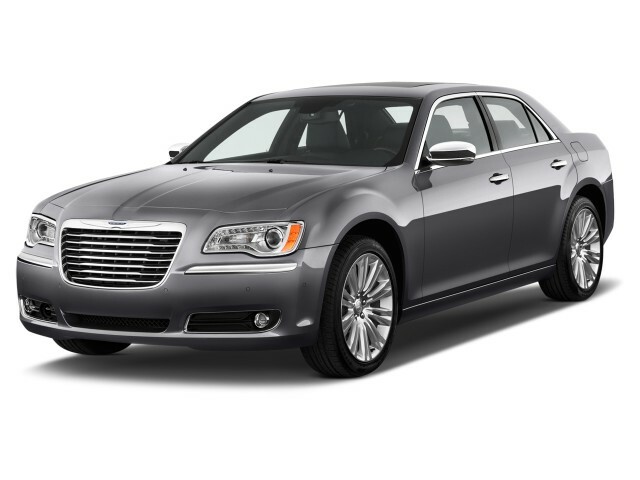 The 300S and 300C are offered with a 363-hp, 5.7-liter HEMI V-8 and a five-speed automatic. While the V-6 is smooth and luxury-car-like, the Hemi is more aggressive and muscle-car-like in sound and responsiveness. These models can get to 60 mph in less than six seconds, but the SR8 can get there in less than five seconds with its 470-hp, 6.4-liter V-8. A NASCAR-like throb completes the sensory experience in the SR8. The 300 doesn't drive or feel small at all, but it has a big-car charm without the usual body roll and mushy, pitchy body motions. As you might guess, 300 models move up the ladder from more comfort-oriented to firm and sport-sedan-like as you step up in engine performance. All models have an absorbent ride and responsive electrohydraulic steering, but as you move up to the 20-inch wheels in some of the models there's a bit more ride harshness. 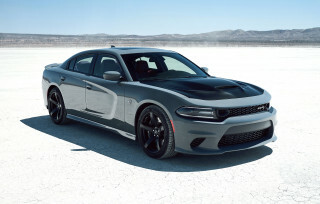 SRT8 models get an adaptive damping system with normal and sport modes, which helps. Even the base 300 includes power windows, locks and mirrors; LED daytime running lights; pushbutton start and keyless entry; a power driver seat; cloth upholstery; dual-zone climate control; satellite radio; a USB port; and an 8.4-inch LCD touchscreen display. Step up to the 300S and you get leather front seats; shift paddles; piano black trim; and performance tires. Premium leather, natural wood trim, power-adjustable pedals, and a heated steering wheel all contribute to the top-lux feel of the 300C, which also includes navigation--and the Garmin-based touch-screen nav system includes real-time traffic info and has been enhanced for 2013. On top of all their performance upgrades, SRT8s get carbon-fiber trim; heated and ventilated front seats; and a layer of instrumentation in its navigation system that displays performance stats like acceleration times and lateral grip. New for 2013 is a Beats by Dr. Dre premium audio system, offering a 12-channel amp, proprietary equalization, and trunk-mounted subwoofer. Also, a special Chrysler 300 Glacier model brings Gloss Black mirrors, Black Chrome grille blades, special eight-spoke Satin Carbon-finish aluminum wheels and special paint hues, along with Piano black interior finishes, special upholstery with leather-wrapped bolsters and French seams, and steering-wheel paddles with a Sport mode. You won't find a sedan that's as svelte, swaggering, and uniquely American as the 2013 Chrysler 300. 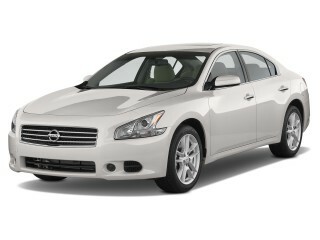 Visually, the 300 sedans are have always hit a sweet spot between modern, ornate, and traditional. In any case, the 2013 Chrysler 300 remains a swaggering hulk of a sedan. Last year's redesign brought a somewhat smoother, less broad-shouldered look, with the cartoonish grille and brash details toned down, too. The cartoonish grille and faux-Bentley look are gone, with brash details toned down. 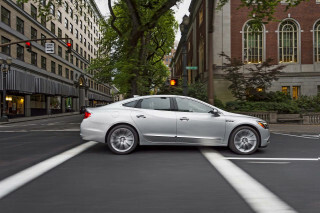 Smaller headlights wear LED eyeliner, while the fenders are more rectilinear, especially on the rear where they've picked up some of the intricate stamped-in details seen on the current Ford Taurus, Buick LaCrosse, even the most recent E-Class. Vertical-tube lamps in back add a more expensive look--almost Cadillac-like. Overall, the look is a bit less showy. And for that reason we think the subdued 19-inch wheels are more fitting; 20-inch chrome wheels are still available and provide the bold note others will want. Hemi-powered models remain all about brawn, but Chrysler 300 models with the V-6 are surprisingly well-rounded performers. The 300 doesn't drive or feel small at all, but it has a big-car charm without the usual body roll and mushy, pitchy body motions. As you might guess, 300 models move up the ladder from more comfort-oriented to firm and sport-sedan-like as you step up in engine performance. All models have an absorbent ride and responsive electrohydraulic steering, but as you move up to the 20-inch wheels in some of the models there's a bit more ride harshness. 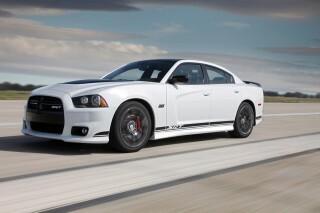 SRT8 models get an adaptive damping system with normal and sport modes, which helps. And no matter which model, this is a car that feels most at home on the highway, or on a two-lane road with long sweepers. The 300 feels like a luxury car inside, with a charming, refined look and feel. Otherwise, this is a model that's improved tremendously in refinement and noise, compared to its first iteration a number of years back. Thanks to thicker glass and more sound insulation, there's only now a faint thrum in V-6 models and, of course, the burble and rumble of V-8 models, while wind and road noise are sealed away. 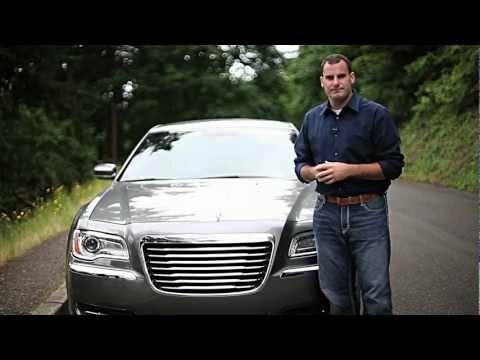 The 2013 Chrysler 300 and 300C have a compelling set of features, and top-notch safety ratings. Safety-wise, the 300 includes all the usual electronic controls and airbags; Hill Start Assist, Rain Brake Support, and Ready Alert Braking are also included. And its crash-test ratings have been top-notch. The Insurance Institute for Highway Safety (IIHS) has awarded top 'good' ratings in frontal, side, and rear impact, as well as in roof strength, and in previous model years it's earned Top Safety Pick status. It's also earned five stars overall from the federal government, including a five stars for side impact and four stars for frontal impact. The Chrysler 300 dials up the tech features, yet doesn't omit any high-end luxury appointments. The 2013 Chrysler 300 ranges from a well-equipped sedan at the base level up to either a true luxury sedan or an assertive muscle machine at the top tier. Step up to the 300S and you get leather front seats; shift paddles; piano black trim; and performance tires. Premium leather, natural wood trim, power-adjustable pedals, and a heated steering wheel all contribute to the top-lux feel of the 300C, which also includes navigation--and the Garmin-based touch-screen nav system includes real-time traffic info and has been enhanced for 2013. On top of all their performance upgrades--like the mammoth 6.4-liter engine, heavy-duty braking, adaptive damping, and 20-inch wheels--SRT8s get carbon-fiber trim; heated and ventilated front seats; and a layer of instrumentation in its navigation system that displays performance stats like acceleration times and lateral grip. New for 2013 is a Beats by Dr. Dre premium audio system, offering a 12-channel amp, proprietary equalization, and trunk-mounted subwoofer. V-6 versions of the 2013 Chrysler 300 are quite efficient compared to large luxury sedans, but Hemi V-8-powered versions are guzzlers. Thanks to the eight-speed automatic transmission and V-6 that's essentially the base powertrain for retail models of the 2013 Chrysler 300, this is a surprisingly fuel-efficient sedan, with EPA numbers of 19 mpg city, 31 highway in rear-wheel-drive form. All-wheel drive drops ratings to 18/27 mpg, although Chrysler boasts that these are best-in-class models. 300C HEMI V-8 models earn highway numbers of up to 25 mpg. Although due to so-called Fuel Saver Technology (cylinder deactivation), you may see even better, as we have, if you can use some self control and keep your right foot light. EPA ratings for the SRT8, with a city rating of just 14 mpg, seem right on the mark, if even a bit optimistic, based on what we've seen. This is a performance model best enjoyed by those who know exactly what they're getting--a blast-from-the-past, large-displacement V-8 engine with a potentially budget-busting thirst. 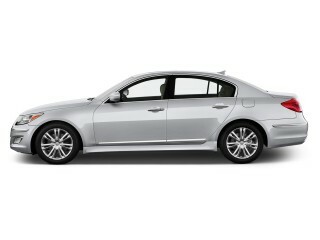 Absolutely outstanding sedan in ALL respects. Great car and a pleasure to driver everywhere. Every once in a while (7 to 10 years) I open up my playbook and decide to give an American Car a try. I have been doing this for the past 40 to 50 years, and 2 years ago I did it again: this time with a... Every once in a while (7 to 10 years) I open up my playbook and decide to give an American Car a try. I have been doing this for the past 40 to 50 years, and 2 years ago I did it again: this time with a Chrysler 300S. A classic looker: large, comfortable, and powerful, with a beautiful eye-catching red leather interior. Take this floating houseboat on a long drive and it's comparable to sitting on your favorite living room sofa. Not bad mileage, either. 30 mpg, more or less. Driving around in the city is another matter, though. 11 to 12 mpg is more like it. Hey, that's what big luxo boxes are supposed to do anyway, so no complaints here yet. Now for the not so good stuff. First, lets start with the blue-tooth telephone hookup known as UConnect (I call it U(DIS)Connect. In the 2 years that I have this vehicle the cell phone connects then disconnects continuously. With several cell phones. I've had this car in on many occasions and the dealer still can't fix it properly. BTW, the GPS, which is part of this unit has been replaced twice, and still doesn't work properly. The auto temperature system does not cool or heat properly. Also unable to fix. The button for the cruise control doesn't respond any more. There is also a grumbling sound in the steering column. Dealer unable to fix. All of the reports say that American cars have caught up to the Imports. Who is anyone kidding. Does anyone believe that the Japanese were sleeping while the Americans were catching up? I went from a Lexus (of which I never ever had even 1 issue with) to this car. Never again.